It is still quite cold in Florence and wet. At least this past Saturday there was a little bit of weak sunshine in between the rainy days as I made my way south of Florence towards Galluzzo. This small town on the outskirts of southern Florence is well-known for its “Certosa” which also gives its name to the “Firenze-Certosa” exit off the A1 road that passes really close by. Just imagine, though, that when this monastery was built in the early 13th century on a hill between two rivers, this was countryside and quite isolated from the city of Florence. The monastery is open every morning and afternoon for a few hours (except for Mondays) for group visits in the company of a lay brother acting as guide. The monastery is still alive as a religious community, even if the original Carthusian order departed in the 1950s. 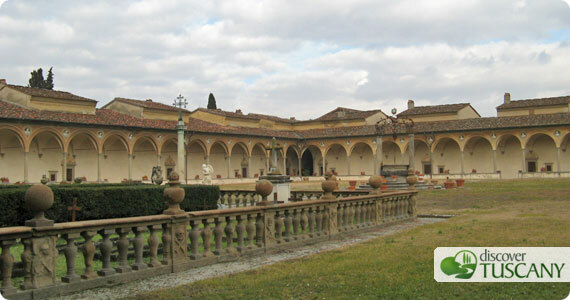 The Cistercian order has lived in the monastery since then, restoring many areas. The order opened the monastery to visits and accepts donations to help maintain their enclosed monastic life as well as the monastery itself. I found the history of the monastery quite interesting, learning about the daily life of the Carthusian order that lived here for centuries. We had the chance to visit the main cloister (pictured in the photograph above), the church (a closeup view of the altar in the photograph below), a hermitage where the monks lived in silence and solitude for most of their lives. The monastery, built upon the will of the wealthy Florentine banker Niccolò Acciaioli, has transformed what is called the Acciaioli Palace into an art gallery where the surviving sections of Pontormo‘s frescoes reside. Pontormo, sheltered in the monastery during the plague outbreak of 1523, painted five lunettes in the large cloister but exposure to the elements greatly damaged many areas of the frescoes. The art gallery, however, also contains paintings of the frescoes just 30 years after they were made which allows us to see a “photograph” of the frescoes and see the missing areas. I highly recommend a visit to the monastery, there is no charge for the visit but donations are expected. Visiting the spaces of the monastery provided a brief glimpse into the life of this monastic community that even today continues to live and pray in silence – I hadn’t realized that this could be possible when just steps away is not just the wonderful, beautiful world of Florence but the rest of our quite busy, noisy and sometimes overwhelming, world. 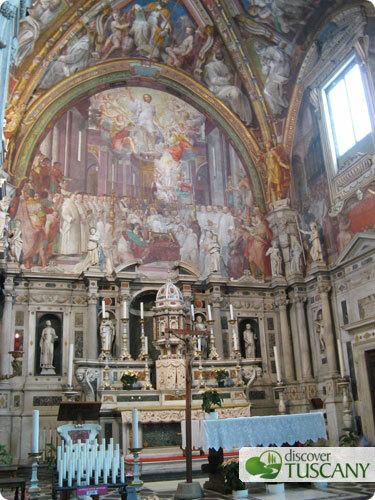 I will work on a more detailed article on the Certosa soon to share more of what I learned this past Saturday. In the meantime, I hope you’ll be encouraged to visit the monastery personally.